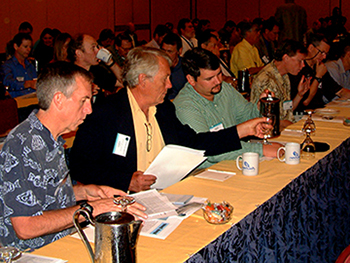 The first annual conference of the Northern Gulf Institute was an excellent opportunity to set the course for the unique integrated research, education and outreach institute for the Northern Gulf of Mexico Region. This institute, and this conference, were all about team-building and collaborative activities. There was the opportunity to meet NGI team members from the academic institutions and the opportunity to learn more about the NGI itself – how it operates, what its priorities are, and how it is designed to take a holistic approach to research, education, and outreach. The primary purpose of this conference was to provide an organized venue for academia, governmental and non-governmental researchers and practitioners to develop the integrated approach needed to address the challenges facing the Northern Gulf of Mexico Region. Active participation is an essential building block for filling the priority gaps in the areas of ecosystem management, geospatial data integration and visualization, climate change and variability effects on ecosystems and coastal hazards. Thanks to our NGI Conference Committee for their hard work in planning this first annual meeting, as it promises to be an important part of the foundation for future research collaboration so critical to the enhanced development of the Northern Gulf of Mexico Region.